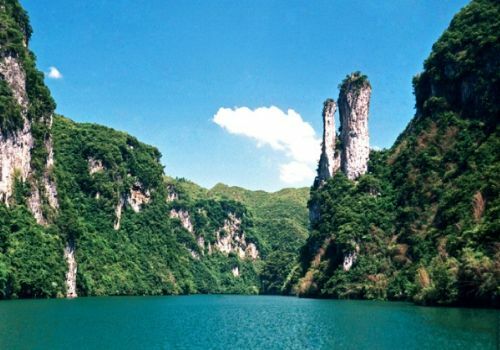 Wuyang River Scenic Area (wǔ yáng hé fēng jǐng qū 舞阳河风景区) is situated along the stretch of Wuyang River that runs through present-day Zhenyuan (zhèn yuǎn 镇远), Shibing (shī bǐng 施秉) and Huangping (huáng píng 黄平) Counties in Guizhou Province (guì zhōu shěng 贵州省), a locality rich in history and culture. There are two autonomous prefectures in Guizhou Province, both of which are home to a large indigenous contingent of Miao people, and one of which, Qiandongnan Miao & Dong Autonomous Prefecture (qián dōng nán miáo zú dòng zú zì zhì zhōu 黔东南苗族侗族自治州) located in the southeastern part of Guizhou Province, is also home to Wuyang River Scenic Area. 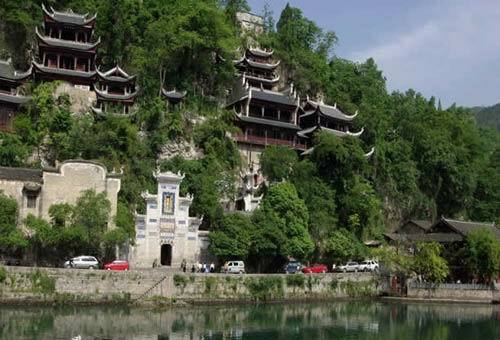 Located in the easternmost of Guizhou Province (guì zhōu shěng 贵州省), Zhenyuan (zhèn yuǎn 镇远) is a famous tourist city in the province. It is in the subtropical climate zone with an average annual temperature of 16.4 °C and a precipitation of 1093.3 mm. The historical and cultural town has total land area of 1,878 square kilometers, 6 square kilometers of which is the urban area, and a population of 230,000 with 40,000 permanent residents. 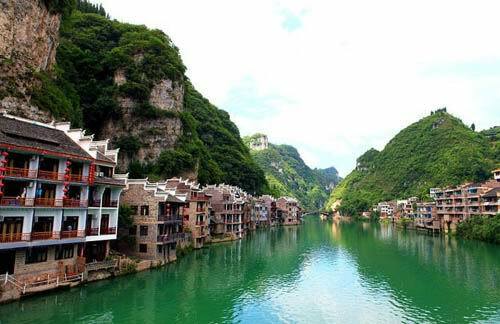 Zhenyuan is one of the experimental counties approved by the state for the reform and opening up of southeast Guizhou Province. Situated in southeastern Guizhou Province (guì zhōu shěng 贵州省), Qiandongnan Miao and Dong Autonomous Prefecture (qián dōng nán miáo zú dòng zú zì zhì zhōu 黔东南苗族侗族自治州) neighbors Qiannan Buyi and Miao Autonomous Prefecture (qián nán bù yī zú miáo zú zì zhì zhōu 黔南布衣族苗族自治州), Zunyi City (zūn yì shì 遵义市) and Tongren City (tóng rén shì 铜仁市) within the province. It is also bounded on the east by Hunan Province (hú nán shěng 湖南省) in the neighborhood of Guangxi Zhuang Autonomous Region (guǎng xī zhuàng zú zì zhì qū 广西壮族自治区) in the south. 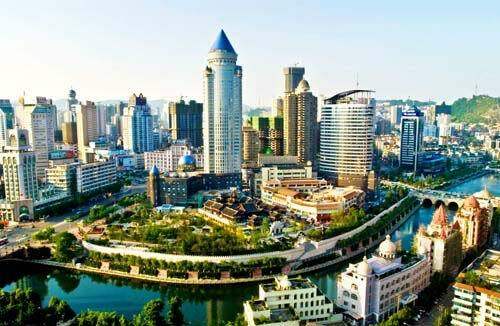 Guiyang (guì yáng 贵阳), capital of Guizhou Province (guì zhōu shěng 贵州省), is located in the southwest of China, on the eastern side of the Yunnan-Guizhou Plateau (yún guì gāo yuán 云贵高原). This city is renowned for its colorful culture represented by various ethnic groups. It is said that in ancient times, the city was surrounded by dense bamboo groves and was famous for producing a musical instrument known as Zhu (zhù 筑). Hence the city is known also as Zhu. Under its administration, there are five district, namely Nanming (nán míng qū 南明区), Yunyan (yún yán qū 云岩区), Huaxi (huā xī qū 花溪区), Baiyun (bái yún qū 白云区), and Wudang (wū dāng qū 乌当区), one city, namely Qingzhen (qīng zhèn shì 清镇市), and three counties, namely Xiuwen (xiū wén xiàn 修文县), Xifeng (xī fēng xiàn 息烽县), and Kaiyang (kāi yáng xiàn 开阳县). 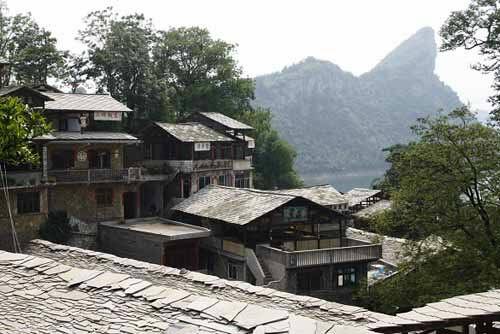 Situated in Huaxi District (huā xī qū 花溪区), Guiyang (guì yáng 贵阳), Zhenshan Ethnic Culture Village (zhèn shān mín zú wén huà cūn 镇山民族文化村) is a world of stone, where door frames, paths, roads and even quite a few utensils are all made of stone, and roofs are covered with slate. An ancient castle and barracks have remained largely intact in the village. Costumed Buyi (布依族) men and women sing and dance at the village entrance as they greet visitors and invite them to join the villagers in pounding glutinous rice to make cake flour, preparing meals and having fun.